The Myall River is a long winding river that begins in the Port Stephens estuary, just before the small township of Tea Gardens. It is the link to the Myall Lakes, and its length is vast. The river enters the Broadwater, the most southern Lake in the Myall system, then runs from the top of the Broadwater onto the northern section where it leads up past the town of Nerong and then to Bulahdelah. The Pacific Highway has been diverted around Bulahdelah, making the once bustling town a sleepy little village. From the Highway itself it's a short three-minute drive that takes you into the centre of town. In town itself there is the pub, general stores, takeaway shops, and numerous businesses that are open most weekends. There is a club, hospital and nearly anything you need can be brought in town, or at the 24-hour service station. As you approach the town from the south, about 100m from crossing the bridge into town there is a rest area and boat ramp, wharf, camping area, free BBQs, and a shady shoreline along the Myall River. The river is fresh to brackish downstream from here, holding fish such as bass, bream, flathead, and a multitude of mullet, and at times school mulloway. Along the top stretch of the river, bass are the most sought after fish. Steep banks with fallen trees are the places you can find quite sizable bass at times. The most popular way to fish this river is from a canoe or kayak, and also walking the banks. Tinnies can be launched at the boat ramp, which is great as its concrete and not very steep. There is a small weir about 500m upward from the boat ramp. At times bass sit near the grates and are easily targeted with a lure landed in the right place. Across from the weir there's a small feeder creek that meanders up behind the pub, and at this junction bass can be taken here at times. About the first 5-10km downstream the water is fished pretty hard, as this is the stretch where most people fish from their canoe or kayak. Walking the banks on both sides of the river and casting lures can connect you with fish, and from the wharf and banks around the rest area you can fish with baits such as worms and yabbies, or use the live cicadas which live in the willow trees along the river bank. The cicadas aren't hard to find as they sing their deafening song of an afternoon. 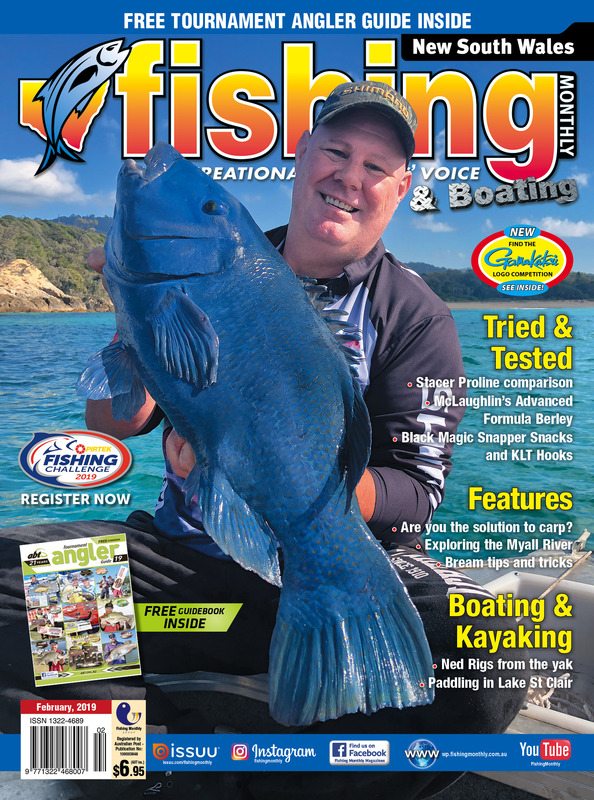 All contents copyright © 2015 Queensland Fishing Monthly P/L.